A bony, 80-year-old body floats around inside the nylon shirt of an unlikely illegal squatter. Kan Kyon Nam keeps a cigarette permanently clamped between what appear to be her two remaining front teeth. But frail or not, if the bulldozers come she wants it known there'll be trouble. "If they try to evict me and demolish my house I'll die under it," she says. "There's no point in trying to stay alive at my age." Fighting talk comes easy to the older residents of Utoro, a tiny Korean village of rickety houses in Uji City, Kyoto, which has been struggling to avoid being wiped from the map for over half a century. 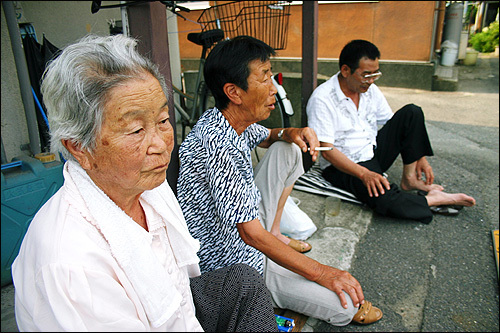 One of Japan's longest-running social disputes, Utoro has been largely forgotten here, but across the Japan Sea many see this community of 230 people as a living symbol of the hardships of Korean immigrants. Now, against a background of soured bilateral relations, the village is again back under the media spotlight. With the 60th anniversary of the end of World War II approaching, the South Korean TV networks plan Utoro specials along with several major publications, including the progressive weekly Hankyoreh 21 which will run a series of two-page articles every week calling for donations to save the village. Last month Lee Kwang Chol of the ruling Uri party and Na Kyung Won of the opposition Grand National Party founded a parliamentary study group to explore the possibility of buying the village from its current owner, a Japanese-Korean property developer. An umbrella organization called "International Solidarity to Protect Utoro" has started collecting money. "We received 5 million won on the first day," claims secretary general Bae Ji Won, who says the movement's slogan is: "Bring Utoro back to life after 60 stolen years." Supporters include the Korean International Network and the National Council of Churches in Korea. Why all the attention for a tiny enclave squeezed up against a Self Defense Force base? The story of these settlers resonates strongly in Korea, where anti-Japanese sentiment is again growing amidst rekindled disputes over how Japan records and commemorates its war history and conflicting territorial claims to the Dokdo/Takeshima islands. "The survivors of Utoro are a symbol of Japanese colonialism," says Bae. "Their story caused me heartache and I thought: It cannot go on like this. Japan has to develop into an open society. That's why Utoro should be saved." Utoro's story begins in the 1930s and 40s when Kan was among millions who came from the Korean Peninsula, many forcibly, to work in Japanese factories, mines and military installations. When the war ended and the local Nissan factory switched from making warplanes to cars, many of the villagers stayed and began working for a Nissan subsidiary. Kan and some 1,300 Koreans built homes on a plot of land owned by the company, raised children and tried to hold on to their shared identity. Then in 1987 they claim Nissan secretly sold the five-acre plot to a land developer, making the entire village illegal squatters and sparking a legal battle that continues to this day. The fight is bitter, and emotional. The Utoro homepage claims that Korean residents are "aliens in the land where they were born," and accuses Japanese officials of "converting from a wartime policy of cultural genocide into a peacetime system of apartheid. "Naturalization is a process rooted in racism," it says before warning that bulldozers will have to "run over" the residents before they'll leave. But despite the fierce rhetoric of resistance and struggle, the number of residents has dropped to 230 as many have left the village and assimilated. "The younger people are going and leaving behind the old," says Akio Gen, who leads the village residents association. 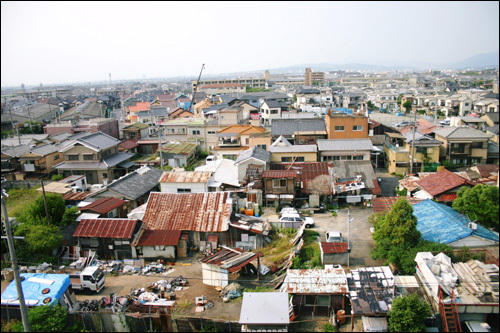 In 1989, a real-estate company took the 69 families of Utoro to court, demanding the evacuation and demolition of the houses. The fight went all the way to the Supreme Court which ordered the village cleared in 2000. But developers have so far balked at the prospect of driving demolition crews and bulldozers through the homes of tough pensioners like Kan Kyon Nam. A new owner promises to solve the issue and there is talk of an inspection by the UN Human Rights Commission, but nobody is holding their breath. Legal stalemate in Japan then, but in Seoul the movement has picked up support in the last year from activists incensed at the looming destruction of what they consider a historically unique village. "The issue has some momentum in Korean society now," says Professor Han Hong Koo, who teaches modern Korean history at Sungkonghoe University and who believes Utoro is probably the last collective residential area in Japan for conscripted Koreans. "When Koreans were conscripted to Japan, they did not have enough money for individual accommodation. So they built big houses for seven or eight families to live together. Two or three of these houses are still left in Utoro and one of them could be a history museum. The house would tell the story of the hardships Koreans had to endure in Japan." Kang Je Suk, secretary general of the citizens' group Peace Project Network believes the movement to protect Utoro is "only beginning," and is critical of how it has been ignored in Japan. "While the abduction of a few Japanese nationals to North Korea was a big topic, the kidnapping of thousands of Koreans during the colonial period to Japan was not. Utoro is not in the news either." The renewed attention and the possibility that the Utoro plot will be bought by supporters and preserved as a memorial to conscripted Koreans, is welcomed by Gen but he is wary of being used for political purposes. "There are the people who want to continue living here and those who want to preserve the history. We are not especially interested in a museum, but some want to force Japan to pay for one as a way of acknowledging the past." In the village, banners and signs promise no surrender to the bulldozers and Kan and other old-timers fan themselves in the heat and remember the past. "This place can tell some stories," she says. "I could cry when I think of the hard times we endured to get here." Third-generation Korean Mari Hamanoi says she wants her children to grow up here. "It's a nice place to live, a solid community. I don't want the history of this place to die." Andreas Hippin (38) is a freelance writer who has been contributing stories to a variety of publications including Japan Aktuell, The Japan Times, Kansai Time Out, The Korea Times and Spiegel Online. Currently Andreas is working on a Ph.D. thesis on the religious dimension of the political thinking of Japan's New Right. Dr. David McNeill is teaches at Sophia and Tokyo universities and writes regularly for a number of newspapers, including the London Independent and the Irish Times. He is a coordinator of Japan Focus.